Marc Reisner, an award-winning author of popular environmental books, also was known for his conservation projects, "green" entrepreneurship, and provocative proposals to solve environmental problems. 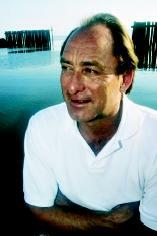 He is best known for his book Cadillac Desert, a history of the use and abuse of water in the American West. Marc Reisner was born in Minneapolis, Minnesota, and grew up in several midwestern cities. He earned a B.A. in political science from Earlham College in Richmond, Indiana in 1970. This background in political institutions would serve him well when he later explored the politics of water in the American West. He later moved to Washington, D.C. to work for the national staffs of Environmental Action—the organization that grew out of the first Earth Day in 1970—and also for the Population Institute. From 1972 to 1979, Reisner was a staff writer and director of communications for the Natural Resources Defense Council at its headquarters based in New York City. In 1979, he won a journalism fellowship that allowed him to focus on his research into United States water management policies in the West. Cadillac Desert. A fundamental part of the story of the American West is the relentless search for that most precious resource, water. Cadillac Desert: The American West and Its Disappearing Water, published in 1986, describes in great detail how massive water projects transformed the American West and caused major environmental damage in the process. In Cadillac Desert, Reisner chronicles the lives of the earliest settlers in the West, the municipal promises of plentiful and cheap water, and the bareknuckled political and financial tactics that were employed to ensure the rapid growth of the Los Angeles population. The story is one of dammed and diverted rivers, political intrigue and shenanigans (especially the rivalry between the U.S. Army Corps of Engineers and the U.S. Bureau of Reclamation), huge financial skirmishes, and the resulting ecological and economic travails. Cadillac Desert became a seminal work; the Modem Library ranked Cadillac Desert sixty-first among its selection of the 100 most notable works of nonfiction written in the English language in the twentieth century. The movie Chinatown was based in part on Reisner's book. In addition, Cadillac Desert was made into a $2.8 million, four-and-a-half hour documentary by PBS (Public Broadcasting Service) and first aired in 1997. After the publication of Cadillac Desert, Reisner wrote a number of magazine articles and several more books. Most notable were the books Overtapped Oasis (co-authored with Sarah Bates, 1989) and Game Wars: The Undercover Pursuit of Wildlife Poachers (1991). Overtapped Oasis provided an analysis of western water policy and a prescription for water reform. Game Wars was the true story of Dave Hall, a retired special agent of the U.S. Fish and Wildlife Service and a very effective game warden combating poaching. Paramount Pictures purchased the rights to Game Wars for development as a film. Reisner also developed a second documentary for PBS entitled The American Nile. This program explored the Colorado River. Reisner gave lectures on environmental issues throughout the United States and the world. He was also involved in a number of conservation projects. He worked with the Pacific Coast Federation of Fishermens' Associations in efforts to remove older and less useful dams in California and to open up vitally needed salmon spawning habitats. In addition, he worked with the American Farmland Trust in its campaign to create stronger incentives to protect California's most valuable farmland from encroaching development. With the Nature Conservancy, he co-founded the Ricelands Habitat Partnership, a program launched by California rice farmers and conservationists. The partnership was formed to develop modern agriculture techniques that enhance waterfowl habitat on private lands and also to protect fisheries in the rivers from which farmers may divert water. This project has become a conservation model and has attracted interest around the world. He also worked with California rice farmers and fiber-product engineers who hoped to make a variety of wood-substitute products from compressed rice straw. As a director of the Vidler Water Company, he promoted environmentally neutral groundwater-banking and water-transfer programs that promised to create new water supplies without dams and surface reservoirs. At the time of his death from cancer, Reisner was at work on a book about California and its history of and inclination toward disasters, both natural and unnatural. Reisner won a number of awards for his writings and conservation projects. At the time of his death, he had just been named a Pew Fellow in Marine Conservation and was to study salmon protection and restoration. Reisner was an author who put his research on environmental problems into practice. His books have educated millions on environmental issues, especially concerning western water history and policy. SEE ALSO Army Corps of Engineers, U.S. ; Bureau of Reclamation, U.S. ; California, Water Management in ; Colorado River Basin ; Land-Use Planning ; Planning and Management, History of Water Resources ; Prior Appropriation ; Salmon Decline and Recovery ; Supply Development. Reisner, Marc. Cadillac Desert: The American West and its Disappearing Water, rev. ed.New York: Penguin Books, 1993. Marc Reisner, 1948–2000. <http://www.pewmarine.org/PewFellows/pf_ReisnerMarc_cv.html> . Marc Reisner: Writer/Environmental Entrepreneur. California Academy of Sciences. <http://www.calacademy.org/calwild/winter2000/html/interviews_reisner.html> .